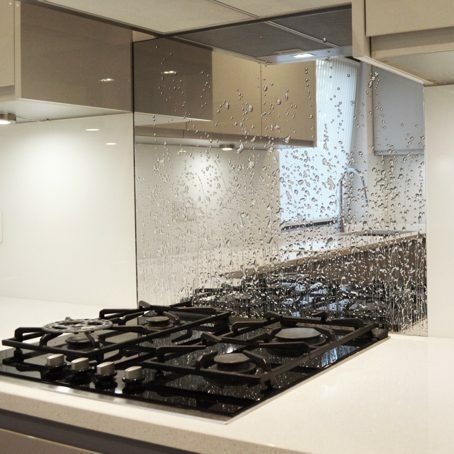 Where do you find the best selection of high-quality glass splashbacks in the UK? GSUK has over 20,000 colours to choose from, or we can custom match a sample you provide. We offer stylish options and solutions, providing the best in bespoke textured glass splashbacks and installation. Our clients enjoy our specialty glass splashbacks in their kitchens and bath areas all over the UK. The beautiful glass splashbacks also grace the most sophisticated and established business settings. What Kind of Textured Glass Splashbacks are Offered in the UK? Textured glass can add that special flair and unique beauty to your splashback rather it be in your kitchen or the bathroom. Back painted glass clad and panels look especially nice when paired up with textured glass splashbacks. Take it a step further and combine beautiful toughened glass counter tops in any color of your choice, as deep blue as the sea, or maybe “fuchsia” with darker colors alternating throughout the room. Or you could try using “fuchsia” and imitate the flowers themselves by contrasting the colors. A beautiful look combined with textured glass splashbacks is the unique mirror cladding such as the “Antique” finish. Shop around GSUK and find that perfect look made especially for you. If you need advice or ideas on what would work for you, don’t hesitate to ask our experts. They will be glad to answer any questions you may have. An added design flair is uniquely expressed with these processes of adding texture to your glass. Sandblast– Sand blasting is done by blasting or pelting incredibly high-pressured sand directly at the glass to get the desired texture and finish. The “sand blasted” glass of GSUK is of the utmost quality and design. “Sandblasting” can create a “frosted glass” look. Acid-Etched– “Acid-Etched” texturing is very interesting and is done by cutting the glass with “acid”, as the name implies. Etching can be known as the art of engraving. Basically, the acid is used to engrave upon the glass. What Are Some Special Features of UK Textured Glass Splashbacks? All textured glass splashbacks are made of highly durable 6mm toughened glass, manufactured with the highest quality of skilled craftsmanship. What are some features of these splashbacks? Heat Resistant Up To 400 Degrees Celsius– 400 Degrees Celsius is capable of handling extreme heat. For example, if you were baking in your standard oven, and the temperature was 400 Degrees Fahrenheit, that would be equal to 200 Degrees Celsius. 200 Degrees Celsius is be considered moderately hot, so you can imagine the heat that 400 Degrees Celsius could resist. The textured UK glass splashbacks are capable of resisting extremely high heat. Custom Cut To Any Size or Shape– GSUK can perfectly fit any area with a textured glass splashback and “state of the art” precision cutting, using CNC (Computer Numerical Control). This is the highest in technology when it comes to glass cutting and employs the use of CAD (Computer Aided Design) capable of cutting any shape or size to perfection. If you have several electrical outlets, or even one, these can fit right into your splashback with no problem. However, you want it to be cut is how it will be cut under our expertise and special supervision to ensure you get exactly what you want in the best manner. Free Quote Estimates– In order to receive your free quote, we will need some basic information. It is best to supply as much as you can so we can give you the most accurate quote. What we’ll need for the quote is where you are going to put your textured glass splashback, your physical location, and the approximate size of splashback that you are wanting. Survey, supply, and fit service, is available for certain areas in the UK. If you have gathered photos or images of something you really like, these would also be helpful. Plans and sketches would definitely be a plus so we understand exactly what you are seeking. Any product you choose from GSUK is going to be “top-of-the-line” and a worthwhile investment. Every phase of manufacturing and delivery is done with the highest of standards, paying heed to delivering a supreme product and services. Special attention is given to make sure that even the smallest of details is not done with haste, but careful precision. This especially applies to the UK textured glass splashbacks as a product of GSUK that exhibits only the best in workmanship and display.